Researchers see parallels between decline of Assyrian civilisation and today’s turmoil in Syria and Iraq. There’s more to the decline of the once mighty ancient Assyrian Empire than just civil wars and political unrest. Archaeological, historical and palaeoclimatic evidence implies that climatic factors and population growth may also have been a contributing factor. This is the opinion of Adam Schneider, from the University of California-San Diego, and Selim Adali from the Research Centre fort Anatolian Civlisations in Turkey. Their findings have been published in Springer’s journal Climatic Change. 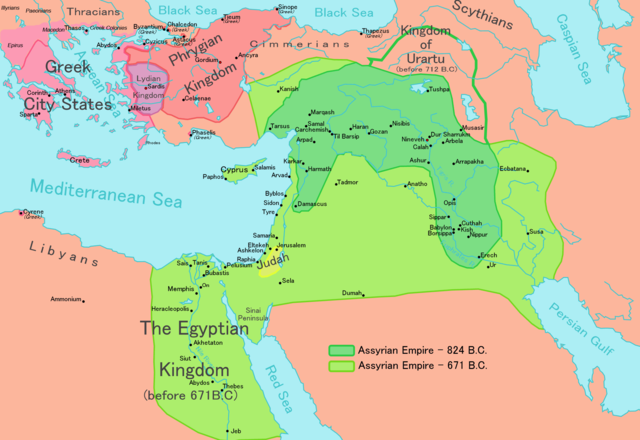 In the 9th century BC, the Assyrian Empire of northern Iraq relentlessly began to expand into most of the ancient Near East. It reached its peak in the early 7th century BC, resulting in being one of the largest of its kind in the Near East up to that time. The Assyrian Empire’s successive rapid decline by the end of the 7th century has perplexed scholars ever since. Most ascribe it to civil wars, political unrest, and the destruction of the Assyrian capital, Nineveh, by a coalition of Babylonian and Median forces in 612 BC. Nevertheless, it has remained a mystery why the Assyrian state, the military superpower of the time, perished so suddenly and quickly. Schneider and Adali claim that factors such as population growth and droughts also contributed to the Assyrian downfall. Newly published palaeoclimate data demonstrates that conditions in the Near East became more arid in the latter half of the 7th century BC. During this time the region also experienced significant population growth when people from conquered lands were forcibly resettled there. The authors argue that this substantially reduced the state’s ability to endure a severe drought such as the one that hit the Near East in 657 BC. They also note that within five years of this drought, the political and economic stability of the Assyrian state had eroded, proceeding to a series of civil wars that fatally weakened it. “What we are proposing is that these demographic and climatic factors played an indirect but significant role in the demise of the Assyrian Empire,” says Schneider. Schneider and Adali draw further parallels between the collapse of the Assyrian Empire and some of the potential economic and political consequences of climate change in the same area today. They highlight, for instance, that the onset of severe drought which, followed by violent unrest in Syria and Iraq during the late 7th century BC, bears an uncanny resemblance to the severe drought and subsequent contemporary political conflict in Syria and northern Iraq today. They conclude, that on a more global scale, modern societies should take note of what happened when short-term economic and political policies were prioritised, instead of ones that support long-term economic security and risk mitigation.